Britney, Rihanna, Lady Gaga, and the pope—yes, the pope—release albums this week. DJ Skribble mixes their hits to find out what would happen if they all met in one room. LISTEN TO AUDIO. This week sees the release of new albums from six headliners: Rihanna, Susan Boyle, Adam Lambert, Britney Spears, Lady Gaga, and the pope. The Vatican’s MC supreme, DJ Benedict XVI, is putting out his own album of “litanies and popular chants” on Geffen. We decided to provide Skribble with another challenge. Since all those artists will be competing at retail (or what’s left of retail) for the top spot on the Billboard charts, we wondered what it’d be like to take all their work and put it together in one giant mash-up. What on earth would they sound like? At the very least, blending all these songs together like this would provide readers with a kind of “listen to this, skip that” version of what’s going on in music. So here it is, a first of its kind, the premiere of The Daily Beast mash-up, here just in time for Thanksgiving. DJ Skribble is a world-renowned DJ who has been voted a Top 10 DJ by DJ Times Magazine for the last five consecutive years. 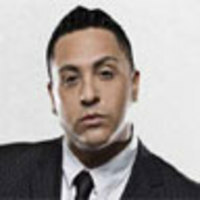 He has recently returned from a USO Tour in Iraq, and Thrive Records (Island Def Jam) will release his Total Club Hits Vol. 4 album in January. He can be found online at djskribble.com, on MySpace and on Twitter.